SusannahsShootingStar is a beginner-easy project using two traditional quilt blocks. Continue reading "New Purchasing Policy"
One Block Only Beginner Quilting, beginners can find their quilting passion. One Block Only Beginner Quilting is a great place for a beginner to learn quilting because I was once in your place: a quilting beginner or, one might say, a novice quilter. Continue reading "One Block Only Beginner Quilting, beginners can find their quilting passion." This is where you can get a Mini-Block Instruction Booklet when you order a pattern. Continue reading "Mini-Block Booklet for 7 offer"
Order your Mini-Blocks Booklet Today! This is where you can order your very own Mini-Blocks Basic Instruction Booklet. Continue reading "Order your Mini-Blocks Booklet Today!" The One Block Only Twelve Block Sampler Quilt, formerly the Block of the Month Club quilt. Continue reading "The Twelve Block Sampler Quilt Offer"
This is the full comment page for all 2012 entries for My Blog. Continue reading "Would Rather Be Quilting Blog 2012-archive"
Continue reading "Wanda, my mother"
Check out page 2 of Create A Website. Learn all about how I found this wonderful Web Host! Continue reading "Create a Website Page 2..."
This is the correct link for the entry below.Or just click on the Create a Website button in the NavBar. Continue reading "correction...create a website..."
Do you want to create a website? But afraid to try? Earn a lifetime income from your own Content-Driven Site. The No. 1 Sampler Quilt and its idenity crisis story. Continue reading "The No. 1 Sampler Quilt and its idenity crisis story." Continue reading "Quilting Beginner Patterns, pg4"
Beginner Patterns for Quilting. 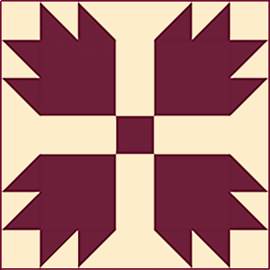 Traditional quilt block patterns B titles. Continue reading "Beginner Patterns for Quilting p.2"
The Beginner Quilting Autumn Specials Get you started, so let's get Quilting! What are you waiting for? There's a special for every skill level. One Block Only Quilting is all about... A fast and easy way of making a quilt any beginner can be proud of. Continue reading "About One Block Only Quilting"
Mini-Blocks are the secret to make the whole process of quilting fast and fun. Mini-blocks are the secret behind One Block Only! They make the whole process of quilting fun! 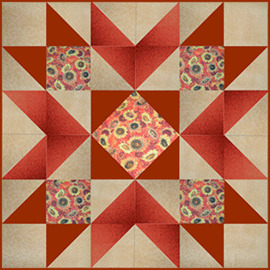 Continue reading "Mini-Blocks are the secret to make the whole process of quilting fast and fun." Beginners Projects. Quilting projects to get a beginner started. Beginners Projects -- Quilting. Every beginner quilting project has to start somewhere. At One Block Only there are many choices. Continue reading "Beginners Projects. Quilting projects to get a beginner started." Traditional Quilt Blocks? That's what One Block Only Quilting is all about... See what you can do with only one specific block as the whole quilt. Continue reading "Traditional Quilt Blocks"
Puss in the Corner. Order the Pattern Today and help out a great group! Continue reading "Puss in the Corner Order Page"